Chatpati is one of my favorite Bengali snacks. 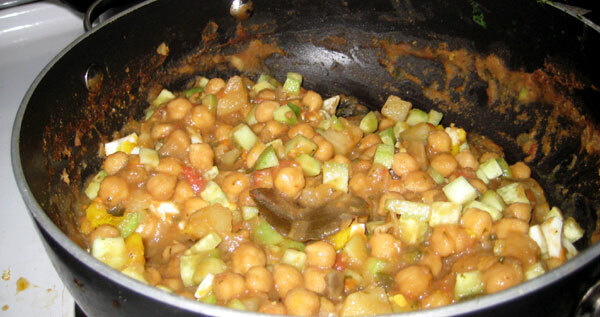 The main ingredients are chickpeas and potatoes. It’s spicy, savory, and tangy, combining a satisfying variety of flavors and textures. And as an added bonus, it’s very healthy! 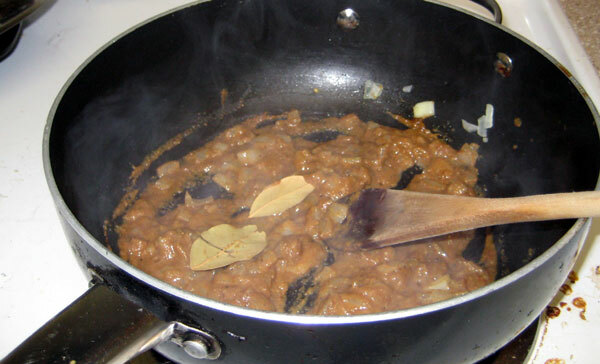 I’ve found that even people who aren’t familiar with Indian food enjoy it. The nice thing about this recipe is that it’s very flexible. Don’t like cilantro? Leave it out. Don’t have any tamarind? Just add extra lime juice. You can make substitutions for most of the ingredients, and the final product will still be delicious. 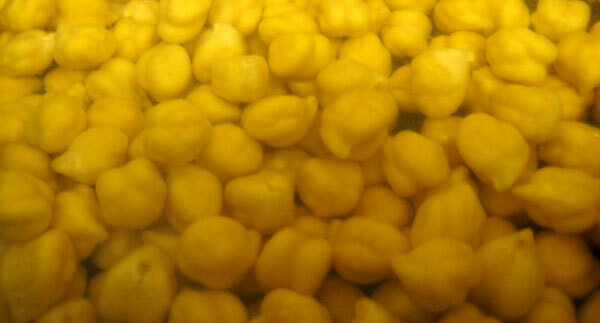 Soak the dry chickpeas overnight. Drain, rinse, and return to pot. Cover with hot water and bring to boil. 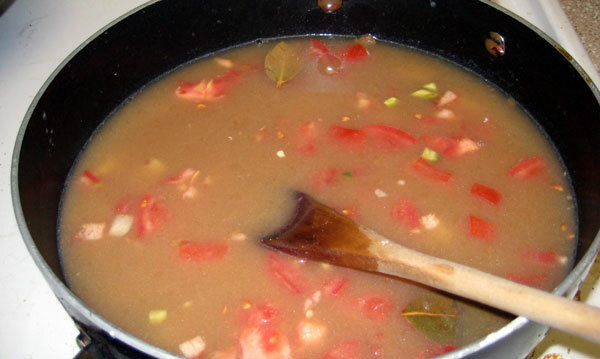 Simmer until tender enough to eat, but don’t allow them to split. Drain them until ready to use. If you want to skip this step altogether, you can use canned chickpeas, but the flavor will be a bit different. In a large pan, heat the oil. Add the onions, and sauté over low heat until soft. Do not brown them. 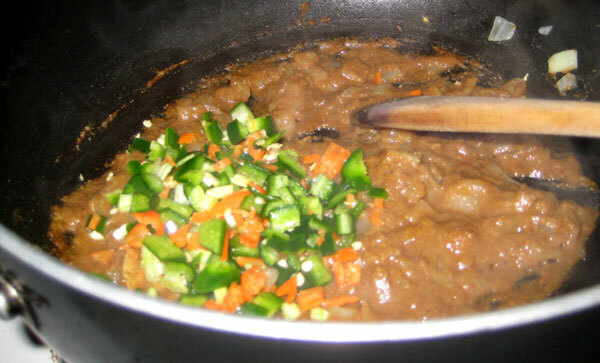 Add half a cup of water, cumin, coriander, bay leaf and tamarind puree. Bring to boil, then simmer until all the water has evaporated. Add the fresh chilis and cook for a few minutes over low heat. The amount and type of chilis just depend on your taste. I like to use two serrano chilis and three habaneros. If you want it less spicy, you can cut a slice into each chili, leaving them whole, then remove them before serving. While the chilis are cooking, peel the potato and dice it into large chunks. You want the chunks to be larger than the chickpeas. Add about three cups of water to your spices, and add the diced potato, tomato and ½ tsp salt. Make sure the water covers the potatoes and tomatoes completely. Bring to a boil, and then lower to a simmer. Allow the mixture to simmer for about 30 minutes, then add the chickpeas and enough water to make sure everything is covered. Allow this to simmer for at least an hour and a half, but preferably 2-3 hours, stirring occasionally. The water will evaporate to create a thick sauce. You can cook it longer or add water to adjust the consistency. Once you achieve the desired consistency, add the cayenne pepper, black pepper, sugar, lime juice, additional salt, and chopped cilantro. 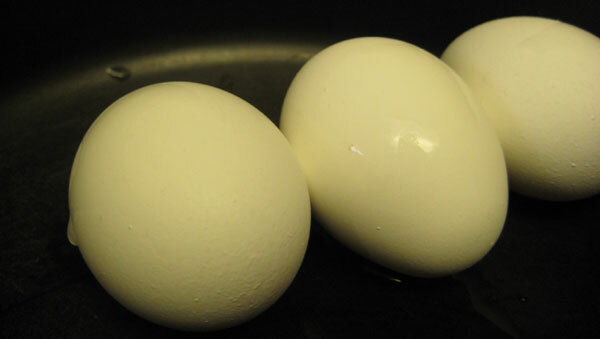 Serve warm and garnish each serving with diced egg and cucumber. This looks delish! Any recommendations for canned brand? Does it matter? I don’t think the brand really matters. All the spices will end up permeating it anyway. The difference between canned and dry is mostly a textural thing. The snack looks great. I like pungent flavor and crunch of the onion. As you said it’s a flexible dish, how about adding raw chopped onions at the end with cucumbers, boiled eggs and cilantro? What other garnish do people use beside them? I took the easy road with the canned chickpeas (also dry ones were hard to get). 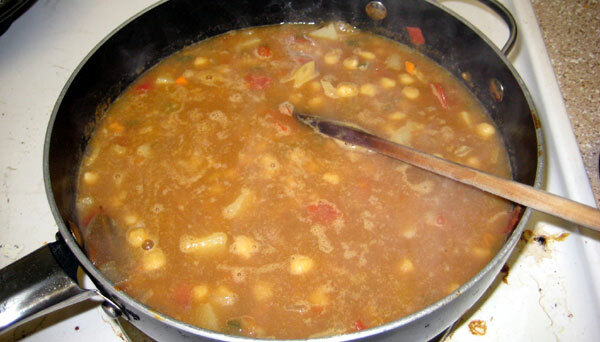 Since chickpeas already felt soft, I added them during middle of simmering. They still came out to be a bit mushy. 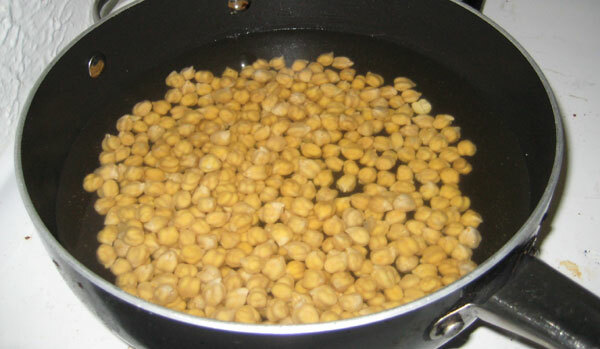 My suggestion, if you add canned chickpeas, is to simmer in a very low heat (sort of marinating it so that spices go in chickepeas). Don’t let it overcook. Even a bit mushy, my chatpati came out delicious. Thanks for sharing. This is a misguiding recipe of chatpati. Majority of the ingredients mentioned here do not go in this dish. Who on earth puts black pepper, oil, lemon juice, cucumber, bay leaf in it? If you do not want to let people know the original recipe you should not even talk about it in public. @citizen. this is the author’s rendition of chapati. Many of the recipes of chapati (and other traditional foods) depend on region, family, etc. easily with softer taste. I really licked the bowl.